AtPresent Recorder 2.0 is screen capture software developed by AtPresent Software. Record user activities from computer's desktop and save screenshots HTML sequence or automatically make a project for AtPresent Editor application to build interactive Flash based simulation or presentation. Record full screen or particular area, catch mouse position and cursor type, save only not equal sequential screens, look through sequence of captured screens and delete those you don't like, etc. Output images formats: PNG-24 or PNG-8. 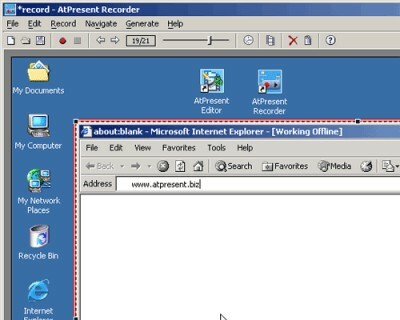 This program is shareware, which means you can download and use AtPresent Recorder 2.0 for free during 30-days trial period. After this period you gonna have to buy AtPresent Recorder 2.0 software for $22.95 or uninstall the program. AtPresent Recorder 2.0 supports English interface languages and works with Windows 98/XP/Vista. Latest AtPresent Recorder 2.0 does not contain any spyware and/or advertise modules, allowing installing it with no worries concerning valuable information loss. Our website has thoroughly tested graphic apps product AtPresent Recorder 2.0, written the review and uploaded installation file (692K) to our fast server. Downloading AtPresent Recorder 2.0 will take several seconds if you use fast ADSL connection. Screentool allows you to capture your screen and save it as a movie of the type you want (QuickTime, MPEG-4, etc.